In the early stages of the Second World War, Hitler, intent on totally exterminating the Jews came up with a plan the Nazis codenamed the Final Solution. Buchenwald, Auschwitz, Dachau, Treblinka, concentration camps were set up to systematically import, incarcerate and exterminate the Jews of Europe. There are those out there who will deny that the Holocaust ever happened, but I’m here to tell you that it did happen, I remember the newsreels from my early youth that showed bulldozers pushing thousands of naked, emaciated bodies of dead Jews into mass graves like so much garbage. This past week Governor Andrew Cuomo of New York signed into law a bill that is every bit as evil and just as satanically inspired as Hitler’s Final Solution, a bill that allows abortion up to the time the child comes through the birth canal. Governor Ralph Northam of Virginia has just gone New York one better, defending a totally barbaric piece of legislation proposed by radical abortion proponents. Under the proposed Virginia bill, Kermit Gosnell - the abortion doctor who is currently serving three life sentences in Pennsylvania for killing babies that survived the abortion process - would be a free man today. Thank God the Virginia bill failed to pass, but the supporters have the support of the governor and they’ll undoubtedly be back. No longer can the “blob of flesh” theory be defended, no longer can the “It’s not really a baby” lie be told, now it’s infanticide, plain, simple and evil, wicked, an ungodly service to the prince of darkness, innocence sacrificed on the altar of sexual convenience and political expediency. A “woman’s right to choose” has turned into a woman’s right to play God, knowingly allowing the death of, what cannot be denied as, a living fully-formed human being. With one stroke of his pen Andrew Cuomo has stripped the protections for abortion survivors in New York State and Democrats basically support doing the same thing in Virginia, but take it to the next level. Is this what the once noble Democratic Party has turned into? Is there not one influential man or woman Democrat that will step forth and denounce this hellish madness. How do the legislators who voted for this evil and the governors who sign it manage even a minute’s sleep at night? If a seed has the potential to become a tree, if an egg has the potential to become an eagle, there is absolutely no denying that life begins at conception and common sense tells you that abortion at any stage of pregnancy is tantamount to murder, but what has happened in New York and Virginia has gone beyond the pale of anything civilized people would allow. And before you abortion apologists - finger poised over the keyboard to condemn me for what I have written and vehemently believe - let me tell you this. I am not your judge, He is waiting behind the final veil at the end of the road we must all walk, where we will all appear and give account for the things we have done while on this earth and we will all stand there, with no place to hide, where the verdicts are final and eternal and there is no appeal. Thank you for writing about this. I myself have had two miscarriages, my daughter had three, and my youngest daughter can't have children.so the idea of abortion is such an afront to us, I can't begin to tell you how angry this makes us among many. This country is setting itself up to lose God's hand of protection. Bless you Charlie for taking up for the unborn ! You have used your talents,to inspire many,thank you for all you do! To me abortion = murder. Plain and straight to the point. Those who are pushing legislation for the pro choice movement are nothing more than the Hitlers of today. There are many avenues to take to prevent pregnancy - abortion shouldn't be one of them. There are many who cannot have children of their own, if the birth mother / parents do not want the newborn child then adoption is another option. Thank you Charlie Daniels for your stand for pro life, etc. My brother, my wife and I are in prayer for you and Miss Hazel everyday. You are a loved American Icon and Patriot. We love you Charlie, David and Pat Howington from Roanoke, VA. We pray for God's healing hands in your life. I agree with most all of your posts and this one is no different. Thanks for saying what needed to be said and saying it so eloquently as only a writer could do. Charlie you need to stick to playing music and stay out of politics! Amen Charlie, these folks don't believe in God and His judgement. We must pray unceasing for God to change hearts and save this Great Republic. Sir, I am in total agreement to what you have said. Stay on your soapbox!! Maybe modern parallels to the Holocaust are hard to come by…. as they should be. However, by the end of WWII they knew they needed to show and document what happened. Today we have an abortion industry murdering an historic 61 +million babies. (US post Roe V. Wade) But the last thing they want to do is show you images or gruesome methods. When Gosnell was on trial the media boycotted it. Some images and information are just to inconvenient and disturbing to reveal. Well, if people really understood what was happening there could be consequences. They sure don't want that. Much better to bury and ignore the evil. I've come to the conclusion that the 'final solution' is ignorance in the first degree. Thank you so much for using your platform to speak for those unable to be heard. Everyday the news is so full of lies and evil of all varieties- with left-wing pundits, at the minimum, agreeing by their silence or at their worst, staunchly defending the insanity. Thank you for giving a voice to what is right and what is good. Thank you for eloquently "calling it what it is". You give us hope. 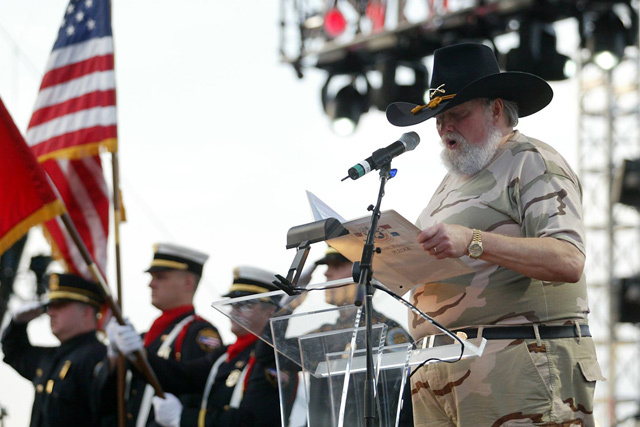 Good for you Charlie Daniels! I love to see celebrities that stand up for our country and for Trump! It's sad how few there are on the right side. I hope that you can get other celebrity's to stand up for this country and speak up too. I can't believe how strong Trump is when he has so many against him all the time but he keeps going for this country and has given so much. I love you for speaking up and I'm also with and have contributed to the "We Build the Wall" that Brian Kolfage started. That man has given 3 limbs for this country and is still fighting for it. God Bless you and those that fight and stand up for this country. Sincerely, Sharon P.S. Saw you many years ago in a little theater in Kansas City and loved it because of the size of it and we sat in the 2nd row just in front of you and the band. We loved it...you guys were and are always GREAT! Thanks again Mr. Daniels! They just can't believe he said it out loud. Once again you nailed it Mr. Daniels. I pray that the hearts of these people will be changed. Thank you so very much for continuing to state the truth in a culture that now condemns those who do so. You are a shining example of Peter's instructions in 1 Corinthians 16:13-14 "Be watchful, stand firm in the faith, act like men, be strong. Let all that you do be done in love." Please continue to use your soapbox to stand strong. Why are there no abortion home videos? Many women have their child-birthings recorded for posterity. Why haven't any women had their abortions recorded? Your commentary on abortion is spot on! Thank you for having the courage to put this out for all to read. Hope you don't mind if I post it on my page. I, for one, am completely horrified by the recent events in New York and Virginia. I can't believe a civilized society would condone such barbaric and evil laws to be passed...for those who think abortion should be the choice of the mother, let me ask you this: what happens if that mother aborts the child that would have later become a doctor who found a cure for cancer, or a person who solved world hunger? Think about it.